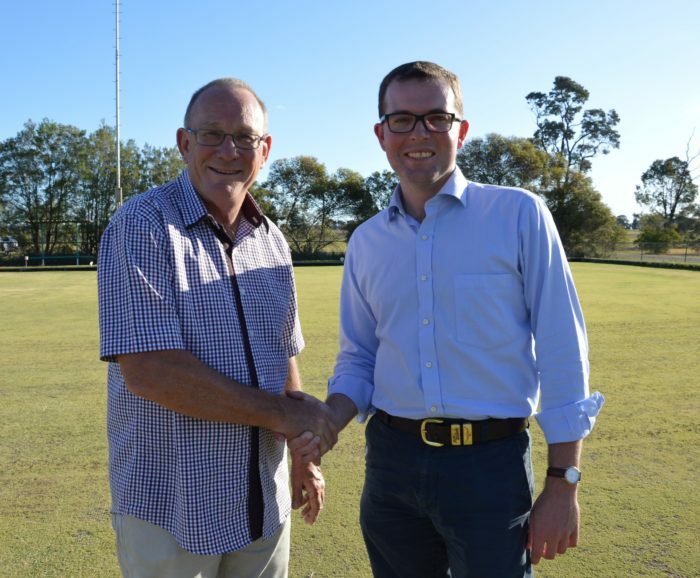 Northern Tablelands MP Adam Marshall, right, with Croppa Creek Bowling Club Secretary Scott Ramsay who was “over the moon” with the new licensing arrangements. MEMBER for Northern Tablelands Adam Marshall today welcomed the NSW Government’s changes to the risk-based licence fee scheme which will save licensed venues in small and remote communities across the region thousands of dollars each year. Mr Marshall said licensed venues in eligible regional or remote localities with less than 1,000 people will be exempt from paying the extended trading hours risk loading. “This is very exciting news for our region as it represents savings of up to $5,000 for individual pubs, clubs, bars, and restaurants in many small towns,” Mr Marshall said. “I have been lobbying for these changes for quite a while as these fees place a huge burden on small licenced venues and in particular local sporting clubs which are more often than not run by volunteers. “They’re often the only venues open at night in small communities, supplying meals, drinks and community entertainment. “In small villages like Croppa Creek and North Star in the north of our electorate, the sporting clubs are the only licensed venues in the town. “These clubs are run solely by volunteers that struggle to keep the doors open for the benefit of the community – a far cry from the larger and profitable venues in larger regional centres and cities. Mr Marshall said eligibility will be determined using population data from the Australian Bureau of Statistics’ most recent census and where accessibility to goods, services and opportunities for social interaction is also considered to be significantly restricted due to their remoteness. “This exemption is recognition that licenced venues in small regional towns are much more than just a business,” Mr Marshall said. Croppa Creek Bowling Club Secretary Scott Ramsay said the club was very pleased with the way the government had resolved the issue. “This will not only help our club but other small venues that struggle to meet the community’s requirements and pay this fee on top of that,” Mr Ramsay said. “This change will save us more than $2,500 a year which is a lot of money for a very small club. “We’re very grateful for the effort that Adam went to in helping to secure this new arrangement. “Croppa Creek has a population of 30 or so and the bowling club has a membership of about 140 which shows the club is an important venue for the entire district. “We have a lot of rural workers and property owners and their families that use this club on regular basis because it is the only licensed venue in the area.